Hey there! Have you missed me? It’s been a wonderful month beginning with a two-week jaunt to the UK where I reunited with my lovely family, met and enjoyed an out-standing day in Bristol with Justin Whitaker (who clearly enjoyed a reason to procrastinate his thesis writing), and managed to squeeze in 61km of forced marching across the City of London (UK not ON – though I have no particular aversion to the London in ON. There is a good Zen Centre there). Finally reuniting with my family after 32 years apart. How does that happen? Thirty-two years is a generation but it’s also a blink in the flash of a universe’s lightning. Still, it was lovely. Before leaving I’d had an exchange on the Shambhala Sunspace site with Jack Kornfield over a sensitive topic of indigenous practice of the Dhamma in Burma. You can read that here and Danny Fisher’s generous comments here. My intent in raising this is the conversation that flowed back channel with Jack (if I can be so familiar after 30-some emails). It reminded me of something he wrote a long time ago about his own return to family: they would like me better if I show up as a Buddha than as a Buddhist. Important to remember when we go out into the marketplace too. Especially those rife with the bones of the living and dead. Wandering around a city with the extensive lineage of London is a good place to do that. Doubly so when your partner has an attachment to events like plagues, cholera, and mass graves. On the surface it’s all about the Great Matter, isn’t it. Life, death and the sticky stuff in between. Digging deeper (awful but so appropriate a pun), it’s not enough to just start with life and proceed to death expecting to have some great revelation about it all. At least that’s what became very apparent as we marched off each day in search of what is delightfully called Plague Pits. An estimated 100, 000 people died of the bubonic plague over two years and are assumed buried in various sites that were once church graveyards. With the growth and modernisation of the city, there are few actual grave sites left. But what we found at the sites we went to was far more instructive of the Dharma than the contemplation on any skeleton I’ve ever met. If you want to see what death looked like in the plague era, head to the Museum of London for the skeletons and a view of the archeological site. The actual plague pits sites however are more interesting for their occlusion of that very fact of death. 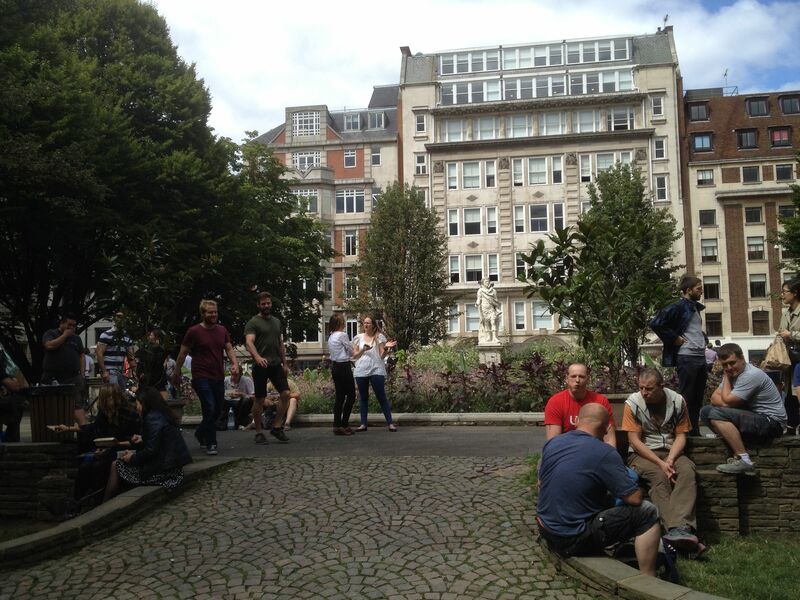 We sat in Golden Square for a while watching the vibrant activity at lunchtime. Ping-pong games, laughter, intense conversations swirled around this rather morose statue of George II; the pigeon poop didn’t give him more rationale for the despair. I suspect George is looking across at that amazing capacity we have for delusion, ignorance of what is actually right there under our noses. It’s not that I wanted to leap up and scream: Do you people realize you’re chowing down your take-away right over a mass grave? It was far more interesting to see the literal and symbolic array of our ability to place life over death. 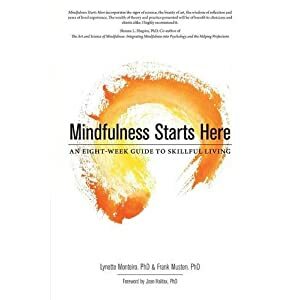 And, in the light of some of the readings I’ve been doing on dependent co-arising or as better named by Thich Nhat Hanh, interbeing, it helped make sense of that whole cycle from ignorance of our inner life’s process to the inevitable end of it. I loved the way the British used the word “rubbish.” “Oh, I’m just rubbish at that!” or “Well, he’s certainly rubbish at driving that car!” I suppose we’re all rubbish at life-the-in-between-and-death also. 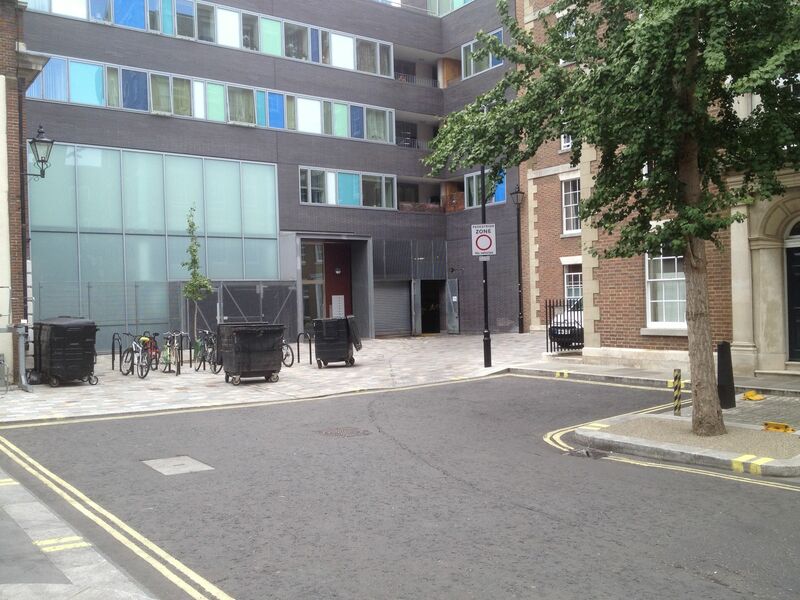 The rubbish bins in what would have been Pesthouse Close made that point. Interestingly, this was near Carnaby Street and the location of the “cholera pump” on Broadwick Street. 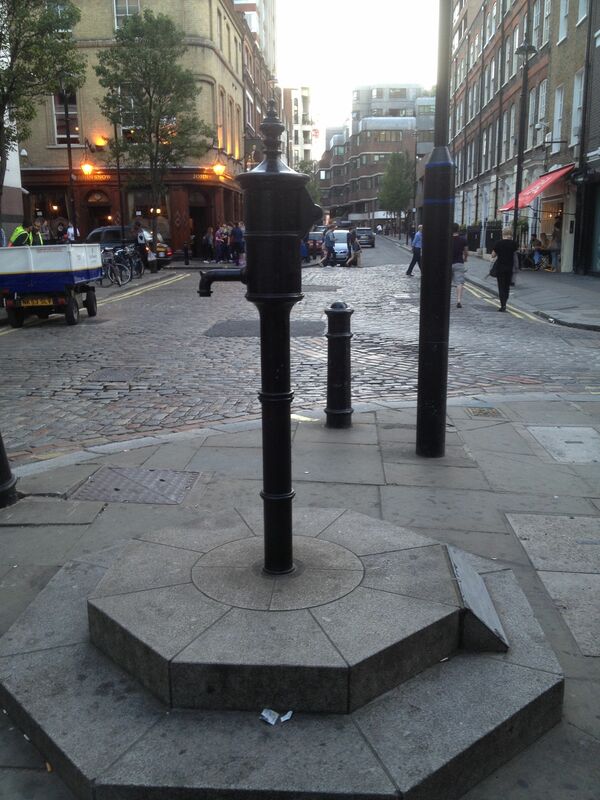 The pump was discovered to be the source of the cholera outbreak in Soho in 1854. Anesthetist John Snow traced the outbreak to this one infected water source (I guess this was one John Snow who knew something!). There’s a pub cater-corner to it called the John Snow – ironic because Snow was a vegetarian and teetotaler for a while but returned to the devil drink and meat. 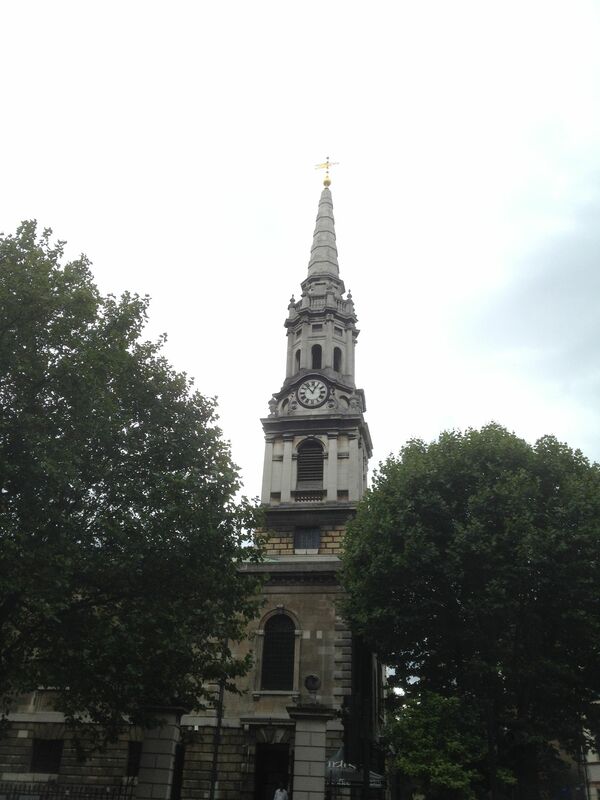 Somewhere tucked behind Tottenham Court Road is St.-Giles-in-the-Fields, a lovely old church where we were convinced we’d find a graveyard but not so. I imagine that as urbanisation continues we may only ever find the dead in museums or paved over by interlock. Just another form of interbeing. In fact, David McMahan, in his book The Making of Buddhist Modernism (p. 148, Kindle edition), noted this is likely “the age of inter” where we realize we inter-exist, interconnect, and interact through the inter-net. I think I like that better than any labels of this age of clinging and deconstruction. The largest plague pit is at the Charterhouse in Charterhouse Square. 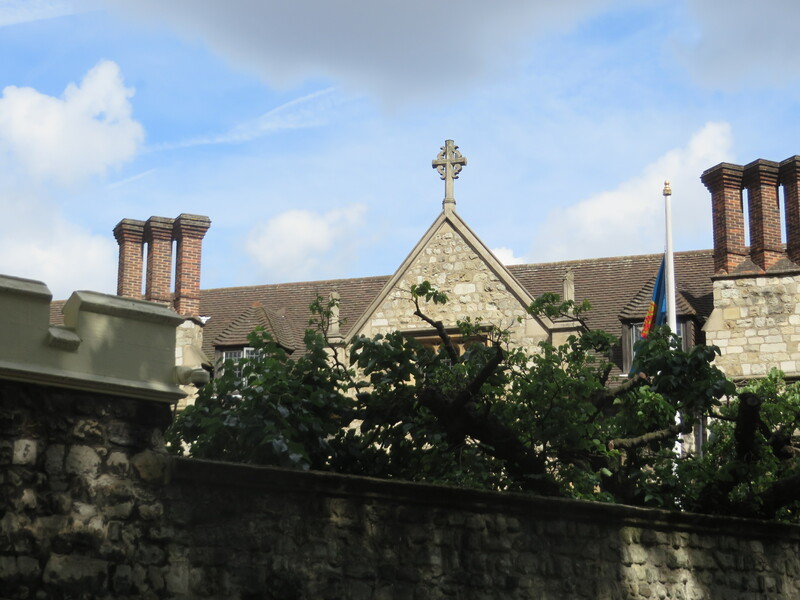 The Charterhouse was a Carthusian monastery until the Dissolution and has been an education center and almshouse since 1611. It continues to function as a home for 40 men who might otherwise be homeless and as a healthcare facility. During the Black Death it is believed 50, 000 bodies were buried in the square – which is now a medical school. Life, death, and life again.